A few days ago, I blogged about the fact that I had been eating women’s protein bars without knowing it. Empirical as I am, I thought that I should perform an experiment to determine the fitness of these LUNA bars for my consumption. Naturally, I set up a proper experiment. In the photos pictured here, you can see me eating both a feminine LUNA bar and a manly CLIF bar (which I take to be the male protein bar produced by the CLIF company, which happens also to produce the LUNA bar). I’ve drawn my own conclusions as to which protein bar is more suited to my constitution, and I’ll afford you the opportunity to form your own opinion as to which is best for your constitution. 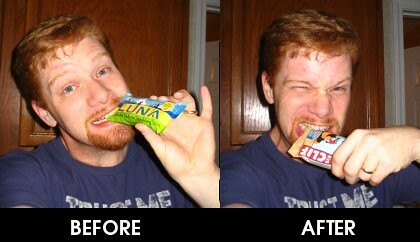 It seems clear from the photographic evidence, however, that the LUNA bar is indeed more feminine and the CLIF bar more masculine.